The Orchid Column: Look up: It's Vanilla! Visitors who pause and look up as they enter the the Orchid Display House are often greeted by this orchid, Vanilla imperialis, cascading over the cedar pergola and bearing flower clusters (and often a fruit) near the terminus of its 30' stems. What a regal flower! 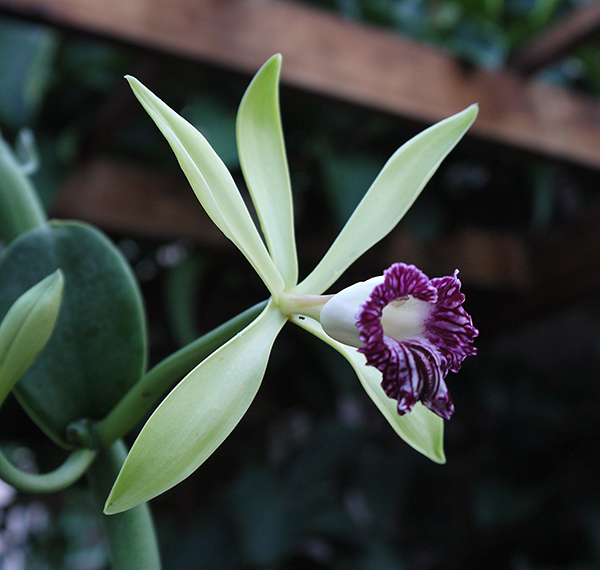 A Vanilla vine is probably the easiest of all orchids to grow indoors. One grew happily in my attic apartment in Cincinnati years ago. As a semi-terrestrial, its cultural needs more closely resemble those of conventional houseplants than its epiphytic relatives Cattleya and Phalaenopsis, whose peculiarities cause their owners so much grief. A peat-based potting mix and some afternoon sun suit Vanilla just fine. It's a handsome vine with thick succulent leaves and stems--the embodiment of the exotic tropical liana. Flower production is a bit trickier. Growers of commercial Vanilla species, who grow their plants outdoors in large nursery blocks, plant their vines in the ground and provide them with tall T-shaped posts to support their vertical growth. They coax their plants into flower by allowing the very long stems to cascade downward. It is the downward growing portions that produce flowers. V. imperialis is native to tropical west Africa.